It looks like a Butterfly Bush. They are great. Looks like a Butterfly Bush (Buddleia) , they are beautiful and live up to their name. I disagree. The flowers are too widely spaced to be butterfly bush, which has tight clusters of tiny flowers with basically no space between them. 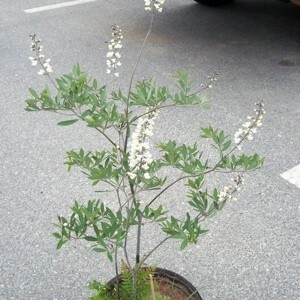 Also they seem to be shaped like pea flowers, so I think this may be a white baptisia (false indigo). When I enlarge the picture it is enough out of focus I can't distinguish the leaf shape, but if the leaves are single, long and slender, it could be butterfly bush. If the leaves have multiple lobes, then it is more likely to be the baptisia or something else in the pea family.